As of Sunday, 5 May 2013, the Royal Canadian Navy will revert to the Commonwealth tradition of wearing a white ensign, with the national flag as the canton, and the national flag as the jack. (b) approves the Canadian Naval Ensign for use by the Canadian Forces as directed by the Minister of National Defence or his or her delegate. Renaming the Canadian Armed Forces Naval Jack as the Canadian Naval Ensign and prescribing its use by the Canadian Forces. To establish a distinctive Naval Ensign for the Canadian Forces as well as the manner in which its use will be governed. 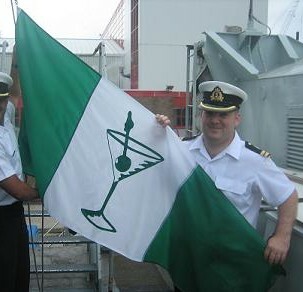 The purposes of establishing a distinctive Naval Ensign are to bring the manner in which the Royal Canadian Navy complies with international maritime law in line with both Canadian naval tradition and modern international practice; and to permit vessels of the Royal Canadian Navy to be clearly and appropriately distinguished from other Canadian flagged vessels. An Ensign is the national flag of a country adapted for use on board a ship and it represents the national colours of the nation’s warships. The Canadian Armed Forces Naval Jack is the flag flown at the bow of vessels of the Royal Canadian Navy. The suit of colours for vessels of the Royal Canadian Navy (i.e. its complement of flags) consists of the National Flag (as an Ensign), the Canadian Armed Forces Naval Jack, and a White (Commissioning) Pennant. For the purposes of the United Nations Convention on the Law of the Sea (UNCLOS), “warship” means a ship belonging to the armed forces of a State bearing the external marks distinguishing such ships of its nationality, under the command of an officer duly commissioned by the government of the State and whose name appears in the appropriate service list or its equivalent, and manned by a crew which is under regular armed forces discipline. The intent of this initiative is to distinguish these vessels from all other Canadian flagged vessels. International law recognizes that every vessel afloat has a national character, and places duties on flag states to regulate and restrict the legitimate use of flags that indicate national character. The sizes of ensigns and jacks vary in size proportionally with the type, size and purpose of the ship and within a class of ship, the Jack traditionally being one size smaller than the Ensign. The suit of colours for vessels of the Royal Canadian Navy has changed several times in the past. The suit of colours worn by vessels of the Royal Canadian Navy was first defined in a 1911 order-in-council. At that time, it consisted of the White (Royal Naval) Ensign at the stern, the Blue (Government of Canada) Ensign as a Jack at the bow, and a White (Commissioning) Pennant at the masthead. As a result of the adoption of a national flag in 1965, the suit of colours for vessels of the Royal Canadian Navy became the Maple Leaf National Flag (as an Ensign and as a Jack) and a White (Commissioning) Pennant. In keeping with established Commonwealth practices, the national flag is normally flown as a Jack, and so was the Maple Leaf flag from 1965 until 1968. The Canadian Armed Forces Naval Jack was designed and came into use in 1968. The absence of a distinctive Canadian Naval Ensign and the wearing of the National Flag as an ensign, by vessels of the Royal Canadian Navy, were inconsistent with the practice of the majority of Commonwealth countries. The principal rationale for the change is to clearly distinguish vessels of the Royal Canadian Navy from other Canadian flagged vessels. Operations that have taken place since the end of the Cold War have brought forward the need for clear national naval identity, particularly in international operations. Likewise, establishing a distinctive Canadian Naval Ensign is consistent with the recent practice of a number of nations having a significant naval presence, most notably Russia, India and China, each of which have purposefully adopted a distinctive naval ensign within the past few years. Establishing a distinctive Canadian Naval Ensign is also in line with other Government heritage initiatives, most recently the restoration of the Royal designation to the Royal Canadian Navy and the Royal Canadian Air Force. The distinctive Canadian Naval Ensign will be flown by vessels of the Royal Canadian Navy, and the National Flag will be flown as the Naval Jack, thereby reversing the current order of the flags. More information about the exchange in the position of the national flag and this flag from the ensign/jack position to what we see today (this flag the ensign, the national flag as the jack) can be seen at http://www.forces.gc.ca/en/honours-history-badges-insignia/display-naval-flag.page. That page has a good history and diagrams of the flags themselves and how they are used. The national flag is in the canton of this 1x2 ratio flag. This document confirms that information; more noting that the national flag is half the hoist and half the fly. The colors for both red and white are located in DSSPM 256-12, which is a "sealed pattern", or information that is not available to the general public. The badge, which was offered as a JPEG file in the public tender, is 55% of the hoist and located in the fly. Once again, the exact location is in a non-public document, called "Canadian Forces Flag Dimension and Placement (RDIMS #4707430)", but according to the image provided by the tender, it looks like it is centered in the second half of the fly and it is about 15-16% from the bottom of the flag. The Canadian Navy Board is comprised of flag officers (i.e. Commodores and above) and meets every few months, according to the lieutenant (the Commodore is a member of the board). When meeting the Navy Board flag flies in place of the senior officer's flag. At Esquimalt this would be at the peak of the main mast described above. The flag is divided diagonally descending crimson over blue with a gold horizontal fouled anchor and is 1:2. Please consider the following article, which appeared in the 8 May 1991 issue of "Trident", the bi-weekly newspaper of the Canadian navy. On 3 May, many heads turned in bewilderment at HMC Dockyard in Halifax. They were looking at the strange flag flying on top of Maritime command Headquarters. Even some of the most senior signalmen didn't recognise the unfamiliar banner. The object of curiosity was the Naval Board flag. The flag, which hasn't flown since 1964, fluttered through the wind once again on that blustery Friday. At Maritime Command Headquarters that day, the semi-annual Naval Board meeting was held. The flag, which features a golden anchor on a diagonally divided field, was presented to Maritime Command after a 27-year separation from the Navy, by Captain (N) J.A.M. Lynch (Retired) of the Naval Officers Association of Canada. The Naval Board, formerly a properly-constituted executive authority until it was disbanded in 1964, comprised selected senior officers who met regularly to discuss naval issues. When unification was adopted in the Sixties, it was felt that there was no longer a requirement for a Naval Board. Today, with the Navy back as a distinct environment, the Board has been reinstated, but not as an executive authority in itself. According to John Watson, secretary to the Naval Board, the Board's authority now lies with its individual members. He says that all Rear-Admirals and above, and a selected number of Commodores, comprise the present-day Naval Board. The Board meets, on average, twice a year in Halifax, Ottawa, or Esquimalt. Mr Watson says the subject matter of the meetings is very broad. He explains: "It can vary from the naming of ships to deeper matters of future policy.". 3) does it still fly the old Naval Board of Canada flag when it does meet? Over the past 18 months I have sent two letters to the Public Relations Officer in Maritime Command in Halifax, asking basically these same three questions, but (much to my embarrassment, as a former Canadian naval officer), was not even granted the dignity of a response. The Commissioning Pennant of a Canadian warship. It is white with a single red maple leaf emblem near the hoist. 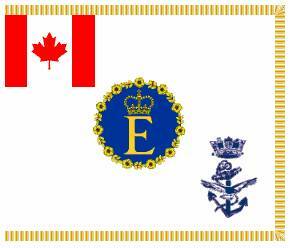 This is a Canadian Naval Regimental flag with Queen Elizabeth’s personal emblem displayed in the center. A Facebook post says it is an ensign. The photo above is reduced from http://www.jproc.ca/rrp/rrp2/visual_flags.html: long truncated pennant vertically divided green-white-green, a green cocktail glass – not a “chalice”, surely - in the white stripe. Related supplier's page, offering three versions (three, five, and nine foot): http://www.magellan-flags.co.uk/magellan-item.php?code=510. The Dictionary of Vexillology shows a grey glass. Apparently Canadians like to call rectangular flags “pennants” (Mr Pearson set the example I believe) and so the modest item in the previous message has, rather alarmingly, grown: http://www.navy.forces.gc.ca/halifax/2/2-s_eng.asp?category=229&title=1961. Naval fun and games. An image from the above page: still vertically divided green-white-green, the flag's centre contains a more realistic rendition of a cocktail glass with cherry or whatever, also in green. The image here of the Lt(N) holding the flag is indeed me, from my RPC (Request the Pleasure of your Company), a name given to a party we throw upon promotion. This photo was taken in 2008. The officer on the left is Lt(N) Art Halpenny, and the photo was taken by Lt(N) Simon Joyal. The three of us were promoted that day and we raised the Gin Pennant on HMCS Halifax to celebrate. That same Gin Pennant also saw its fair share of masts in the fleet as we managed to get the majority of the east coast fleet to buy us drinks that year. Thanks for the great trip down memory lane. All the best.